Want to learn the basics of a foreign language on your own time, at your own pace, in your own way and at minimal cost? A new business taking shape in Eastern Kentucky University’s business accelerator might be your answer. Language B Inc., the brainchild of Brian Ragsdale, is an online (languageb.com) software tool for foreign language education. The business, housed in the accelerator since February 2012, is the culmination of a longtime dream and perfect merger of the interests, talents and ambitions of a well-traveled Kentucky native and EKU graduate. If necessity is the mother of invention, Ragsdale’s “baby” is carving its own niche as a highly personalized and customizable option in the field of language learning. The initial target audience is the higher education community. Most of the company’s marketing efforts to this point have been directed to colleges and universities worldwide and to students themselves. The cost to use the site is $9.95 or less per month, but for now Language B is free to anyone with a valid EKU e-mail address. Paid or free, a subscription gives users access to every level of every language offered, as well all the lessons created and shared publicly by other members. Language B offers users full multimedia, including text-to-speech, for all content; as well as interaction through games, discussions and presentations. Users can create their own lessons, including vocabulary, conversations, grammar, expressions, culture, reading, pronunciation, and songs; create customized games and quizzes; and access every public lesson of every language shared by the Language B community. The Language B site features more than 20 languages, a number that is expected to grow as demand warrants. It’s the type of program that would have attracted Ragsdale’s interest when as an EKU student he was a two-time exchange student at Eastern’s sister institution, Yamanashi University in Japan. Ragsdale went on to live four years in Japan, where he worked with a software company. 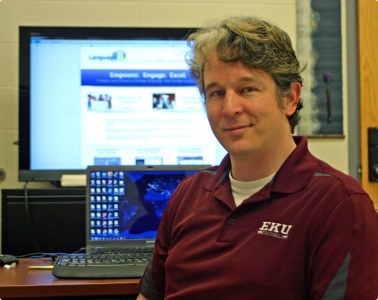 Locally, he has taught courses in learning Japanese through EKU’s community education program, where one of his students was Eastern President Doug Whitlock, a frequent visitor to Japan. He also has taught American managers at some Japanese-owned companies in the area and in the University’s English Language Institute. His interest in programming stems in part from a grandfather and two uncles who worked for IBM. Ragsdale remembers writing his first computer program on an IBM PC Junior in 1985. Today, Language B employs several part-time and full-time programmers, as well as marketing and graphics specialists. In addition to the Language B staff, that “team” includes several associated with the Center for Economic Development, Entrepreneurship and Technology (CEDET) in EKU’s College of Business & Technology: Kristel Smith, executive director of the Innovation and Commercialization Center (ICC) and the Accelerator; Michael Rodriguez, director of the Small Business Development Center (SBDC); and CEDET Director Ian Mooers. The Accelerator team predicts success for the fledgling firm. It was the kind of thinking that took root at his alma mater. The EKU Business & Technology Accelerator, which includes the SBDC and ICC, focuses the energy, skills and intellectual capital of the university on enterprise creation and expansion. In order to facilitate business start-up and growth, it provides shared resources, affordable office space, and access to faculty, staff and management assistance. For more information about the accelerator, visit bizaccelerator.eku.edu. For more information about Language B, visit www.languageb.com.